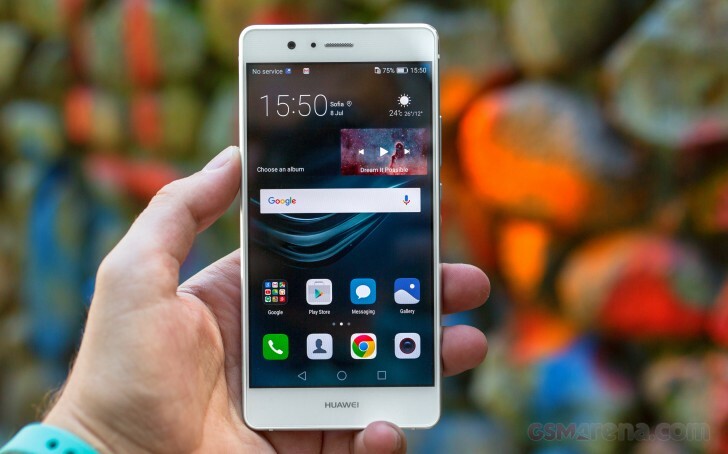 The Huawei P9 lite runs on Android 6.0 Marshmallow, skinned with Huawei's own Emotion UI, in its v4.1 iteration. It has been pretty consistent between versions and recurring Huawei users should feel right at home if upgrading to the P9 lite. The lockscreen has many images on rotation - every time you wake up the device, you're greeted by a different wallpaper. You may not see them often, however, as the fingerprint unlock will take you straight to the homescreen. If you do decide to wake up the P9 lite via the power button, you get a large clock with a date, steps counter (if enabled) and a shortcut to the camera. You can also quickly start the camera by a double press of the Volume Down button. You can pull up an iOS-style menu from the bottom, where you get yet another camera shortcut, but also quick access to the flashlight, calculator and voice recorder. The pull-up menu will give you eight more options for control over the changing covers (these look like music player controls, which may be slightly confusing). The fingerprint reader is quick, but not the fastest we've tried. It does do tricks, however. You can use it to swipe down the notification area or flip between photos in the gallery. Yep, the reader works like a mini touchpad. There are simple touch and hold gestures too - you can use it as a shutter key (handy for selfies), to answer a call or mute the alarm. Beyond the lockscreen is the homescreen, which also doubles as an app drawer. You can set the screen to fit 4x5 (default) or 4x4 icons. There are also a couple of features that help to keep things tidy, e.g. icons can automatically move to fill up newly the open space when you delete an app just as on iOS. Theme options are available in the Emotion 4.1 UX. They can swap your wallpapers, icon pack, and lockscreen style (as a bundle or individually, if you prefer to pick and choose). As part of the extensive Smart assistance package, you can also customize the bottom navigation bar. You can swap the task-switcher and back keys, or even add a shortcut for the notification area. The notification area has two panes - one that holds all notifications sorted in a timeline, and another for all of your quick toggles. You can swipe between the two panes, but you need clean space to do it. Otherwise, the swipe will remove a notification instead. The swipe up control center from the lockscreen is not available, unfortunately. The P9 lite's task switcher lets you swipe up and away unwanted apps. A downward swipe locks the app so that when you hit the Kill all button, it remains open. For certain scenarios, like in-car use, you can enable a Simple homescreen mode. It looks a bit like Windows Phone with large tiles for easy tapping. This mode even increases the font size in some apps. The P9 lite has voice commands, but it's a lot more limited than what the flagship P9 had (e.g. you can't setup a trigger word to wake the call hands-free). Motion control on the Lite model is more limited, you only get flip to mute. There's no knuckle detection and you can't launch apps by drawing a letter. Huawei had granular control over app permissions before Android brought it officially and its implementation is still ahead. You also get precise control over data usage. 4G LTE data is metered separately (in case your plan has limited 4G data) and you can block apps from using mobile data (or Wi-Fi, though that's the rarer use case). You can similarly configure background data (this can improve battery life) and roaming data (say, let WhatsApp use roaming so you stay in touch and block others). This is part of Huawei P9 lite Phone manager, which also features a notification center. You can control which apps can send you the three types of available notifications - the shade notifications, the lockscreen notifications and the banner style notifications.